In this lesson, we will learn how to compare two data set distributions using box plots. Using the given box-and-whisker plot, find the range of the data. 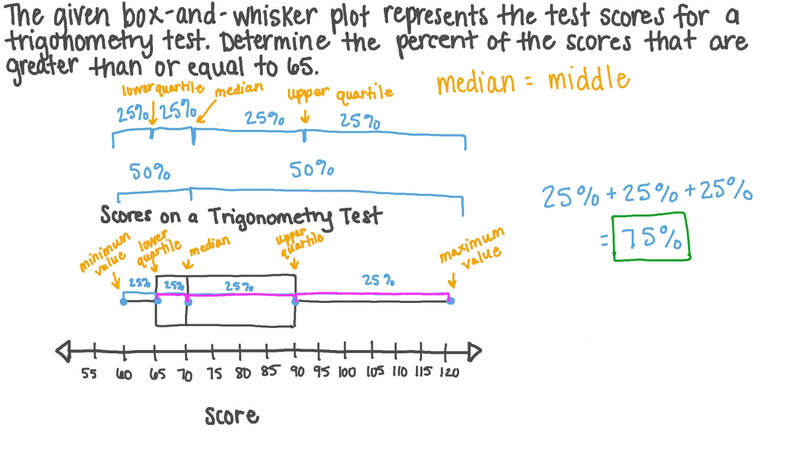 The given box-and-whisker plot represents the test scores for a trigonometry test. Determine the percent of the scores that are greater than or equal to 65. State whether the following statement is true or false: The data in the interval between the lower quartile and the median is more spread out than the data in the interval between the median and the upper quartile. State if this is true or false: The value 48 is an outlier. Which of the following sets of data can be represented by this box-and-whisker plot? The lower quartile, median, and upper quartile of a data set are 𝑥 , 𝑦 , and 417, respectively. In a box-and-whisker plot representing the data, the median separates the box into two equal parts. Which of the following are possible values of 𝑥 and 𝑦 ? Using the given double box-and-whisker plot, determine the percent of the boys and then the percent of the girls who are 66 inches or shorter. This double box-and-whisker plot compares the prices of books in 2 bookstores. What percent of books in bookstore B have a price of at least 90 dollars? The lower quartile, median, and upper quartile of a data set are 𝑥 , 𝑦 , and 247, respectively. In a box-and-whisker plot representing the data, the box between the median and the upper quartile is twice as long as the box between the median and the lower quartile. Which of the following are possible values of 𝑥 and 𝑦 ? State if this is true or false: The value 64 is an outlier.